It is May! 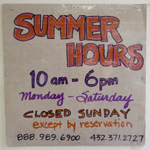 Time for Desert Sports to go to SUMMER HOURS! The office will be open from 10 am to 6 pm, Monday thru Saturday. Closed Sunday except by reservation. Thank you for a great spring season! !